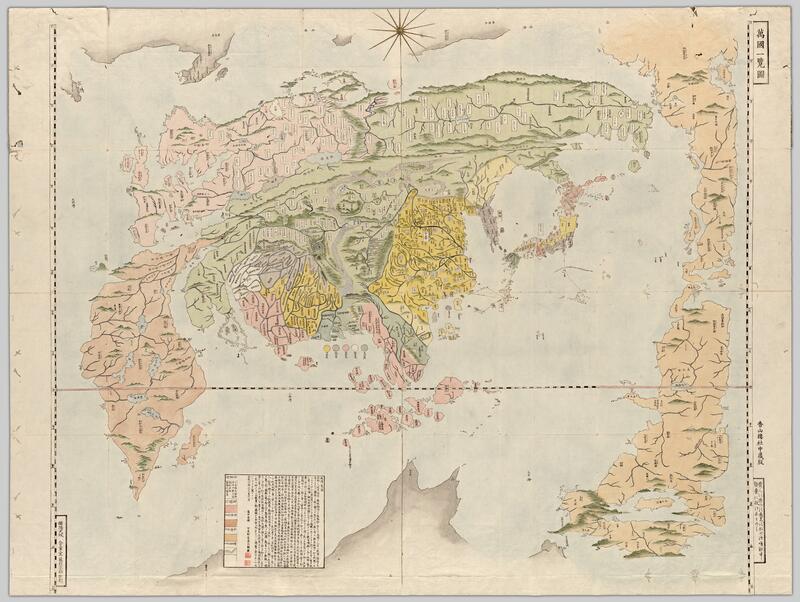 Click here to visit UBC’s digital collection of Japanese maps of the Tokugawa era. The sheer variety of the world maps included in that study reveal that our perception of the earth’s surface is at the same time subjective and shaped by the historical and cultural context. Such maps are not concerned with accuracy in the sense of corresponding to scientific data about the earth’s surface. They are however accurate in their portrayal of thought patterns. Maps of the past also constitute rich sources for understanding the history of thinking about space. But they are often dismissed as unimportant. This is because the study of maps in history has often been undertaken by historians of science or by geographers concerned with advances in topographic accuracy. This is true also in the study of the history of Japanese maps. In 1983, for example, Jacobs concluded her thesis on world maps in the UBC collections with the bleak conclusion that Dutch world maps did not have as large an influence in Japan as would be expected. That conclusion was based on a teleological concept of scientific knowledge spreading from Europe outwards. What that conclusion did not consider was the parallel system of knowledge that was evolving inside Japan. It was made up of Neo-Confucian intellectuals, Dutch Studies scholars, and Buddhist monks. The Rangaku 蘭学 (‘Dutch Studies’) scholars received Western knowledge directly through access to and translations of Dutch books obtained mainly through the Dutch trading post on Deshima, the sole point of trade with only the Dutch. Confucian scholars, on the other hand, relied more on the precedent of a map of the world initially produced by the Jesuit missionary to China Matteo Ricci, or on maps brought in through other trade routes with South and Southeast Asia. Fig. 1: Bankoku sōzu 萬國総圖 (‘Map of All Nations’), late seventeenth century, colour and ink on paper, 113.6 by 55.8 cm.Source: UBC Library, Rare Books and Special Collections, G3200 1645z .S5 (Click to enlarge, or visit source here). An alternative approach to the study of historical maps has emerged in the last decades, reconsidering the networks and mentalities that produced maps. Here I would like to illustrate the usefulness of that approach for cultural history by using examples from the UBC collections. For brevity, let’s focus on two issues: the first is the variety of uses and meanings that the world map had in early modern Japan. To discuss this I purposely choose maps that do not fit into the received narrative of cartographic history in Japan. 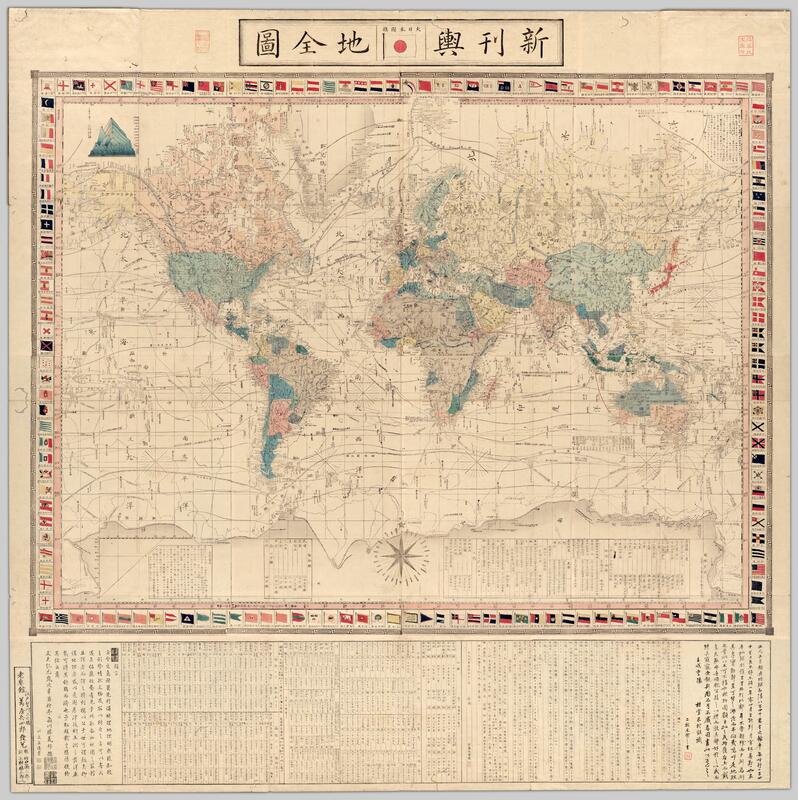 The second issue is how the uses and meanings of world maps changed after the middle of the nineteenth century, when Japan entered a phase of rapid modernization. To understand the role of world maps in East Asia, a brief review of pre-existing developments is necessary. 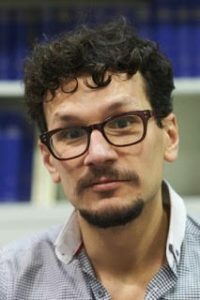 An important premise for thinking about geographical knowledge in Japan is the fact that for most of its history, the main point of reference for Japanese culture and thought was the continental culture typified by Confucian and Daoist classics and Buddhist sutras translated in Chinese script and other narratives. Until the sixteenth century, in Japan these references mostly related to an idealized Tang period. Its world view was that of a Central Kingdom surrounded by uncivilized nations. In other words, space was defined concentrically in terms of the civilization level of its inhabitants. This world view was updated at the end of the 16th century by Jesuit proselytizers who used geographical knowledge for persuasiveness. This resulted most notably in a customized world map written in Chinese by Matteo Ricci, a version of which appears in figure 2. Although hailed by previous research as a progress in geographic knowledge, this map also overlapped neatly with the established concept of the Central Kingdom, and the pre-existing tradition of encyclopaedic knowledge. It was thus adopted as expressing the world view of Neo-Confucianist scholars, who came to dominate the official intellectual discourse in Japan beginning with the seventeenth century. In the latter frame of thought, geographical knowledge was organized indexically as information associated with specific lands and their inhabitants. [Fig. 2] For example, an 1855 illustration of a country from the American continent was accompanied by the following text: ‘Otherwise called Labrador, this country lies to the northeast of the United States, and on its eastern shore is a large trading post of Igirisu (‘England’). They say that all the people’s features are small: their hands are like that of twelve-thirteen year old kids, they are naturally clever, but when they have to count small objects they can’t remember more than twenty. They don’t have regulations separating the high from the low classes. Could this be the so-called Kobito 小人 (‘Small People’)? The climate is extremely cold, and they are missing many things [of use]. They are often fishermen. They are situated between 44 and 62 degrees from the North Pole.’ The author was trying to insert an update to geographical knowledge into the pre-existing category of the ‘Small People’ that had appeared in Matteo Ricci’s world map. Fig. 2: Shin Buritania 新猊利太怩亜 (‘New Britannia’), from Gaiban yōbō zuga kon 外蕃容貌圖画坤 (‘Pictures of Foreigners’ Features’, vol. 2), 1855, colour woodblock-print, 18.2 by 25.3 cm. Source: UBC Library, Rare Books and Special Collections, G3201 .A5 1855 T2 V.1-2 (Click to enlarge, or visit source here). Fig. 3: Koyano Yoshiharu, Bankoku ichiran zu 万国一覧図 (‘Map of All Countries at a Glance’), 1809, hand-coloured woodblock print, 105 by 140 cm. Source: UBC Library, Rare Books and Special Collections, G3200.1809 K6 (Click to enlarge, or visit source here). Fig. 4: Bankoku no zue 萬國之圖繪 (Map of All Nations’), ink and colour on paper, 108 by 161 cm. Source: UBC Library, Rare Books and Special Collections, G3200.1800z (Click to enlarge, or visit source here). Other manuscript world maps from the same intellectual environment are further removed from the image of the world as we visualize it now. [Fig. 4] But rather than dismissing them, we need to understand that they do not depict topography but rather mental connections that form a hierarchized topology, tied by unfamiliar routes. From this point of view, such world maps are snapshots of the mental landscape of intellectuals at the time. Fig. 5: Shibata Shūzō, Shintei kon’yo ryaku zenzu 新訂坤輿略全図 (‘Newly Revised Map of the Earth’), 1852, hand-coloured woodblock print, 35 by 69.5 cm. Source: UBC Library, Rare Books and Special Collections,G3200.1852 S5. (Click to enlarge, or visit source here). This is an egg-shaped map, and the land shapes lose their accuracy around the two poles. In the case of a double hemisphere map, the centre is compressed, while in a flat map the longitude lines widen the closer one gets to the poles. I would like the viewers to understand that and not think it odd. Again, the Ricci-style ‘egg-shaped map’ is compared to the double-hemisphere map, but the breakdown of the flaws of various projections puts them on an equal par, with no political associations to Holland or China. This is followed by a clear exposition of the map’s purpose of disseminating knowledge. Although the study of the history of the world is mentioned, there is no reference to foreign sources as informing that knowledge. Fig. 6 Satō Masayoshi, Kankyo shinkan yochi zenzu 官許新刊輿地全図 (‘Newly Published Map of the Earth’, 1862, copperplate print, 134 by 127.Source: UBC Library, Rare Books and Special Collections, G3200.1862 T2. (Click to enlarge, or visit source here). The map in figure 6 is a translation of a Dutch map  which is a continuation of Edo period practice, but also marks the end of an era: this is among the last Dutch maps to be translated in Japan. From then on, British maps and the English language would serve as references. Tellingly, this map’s prime meridian crosses through Washington D.C. This is also one of the first maps on which Japan appears coloured in red (on the initial map it was in lavender colour). Colour-coding was not standardized before this period, and the red colour can be seen as corresponding to the new flag of the Japanese empire, which was also standardized around this time and is featured prominently in the title. Interestingly, the island of Sakhalin, which was disputed with the Russian Empire, is coloured orange, an intermediary hue to red. The same red is used to highlight a specific sea route leading from South China through the Malacca Straits, South India and the Red Sea with an overland section to Cairo (The Suez Canal would only be completed in 1869). This was the main access route for Japanese travellers to Europe. The 1864 Japanese embassy to Paris followed this route, and upon meeting the scholar Phillip Franz von Siebold, the vice-ambassador Kawazu Sukekuni gifted him a copy of this same map. World maps were now used as tools of international diplomacy. After the Meiji Restoration in 1868, being conversant in the geography of the world was one of the prerequisites of being a modern citizen of Japan. But not all geographical knowledge came from Europe: a 1871 work about the United States, for example, featured both a ‘one glance’ view of the world as well as a double-hemisphere projection. It was essentially the reprint of a work written in Chinese by Bi Ziwhen (裨治文), sinicized name of Elijah Coleman Bridgman (1801-1861), the first American Protestant Christian missionary appointed to China. At the back of the last volume is a list of works available from the same publisher. One third of these titles are of maps or geography-related books, which speaks to the importance of this topic in the period. The list is followed by an inscription that translates roughly as: ‘On the left is a catalogue of newly published books brought by foreign ships, including illustrated explanations of the celestial and terrestrial globe, as well as various other books that must be read now. They are issued every month, and willing gentlemen from any corner of the land can consult them.’  What is significant here is that although there was unprecedented access to information about the outside world, this information was still often packaged in the writing format of neo-Confucian traditional knowledge. Even the audience was phrased in terms of the Confucian ideal of the superior person (junzi 君子). Coupled with the lack of standardized teaching manuals for the newly established education system, this led to a plurality of cartographic solutions between worldviews. This situation gave way after 1890 to a more nationalistic geographical discourse encouraged by the Imperial Rescript on Education. Manuals on geography would be increasingly standardized and would impose a new learning system that would eventually replace the neo-Confucian paradigm. Just like the mental maps of the world that began this argument, maps of all periods and regions show that the world is always drawn according to a particular person’s worldview as a response to other participants in his social network. When we consider the variety of world maps in early modern Japan, they show us that mentalities did not change so easily and immediately after the availability of Western maps. They configure a parallel history of visualizing the globe that needs further investigation, starting from other maps in the UBC collections. 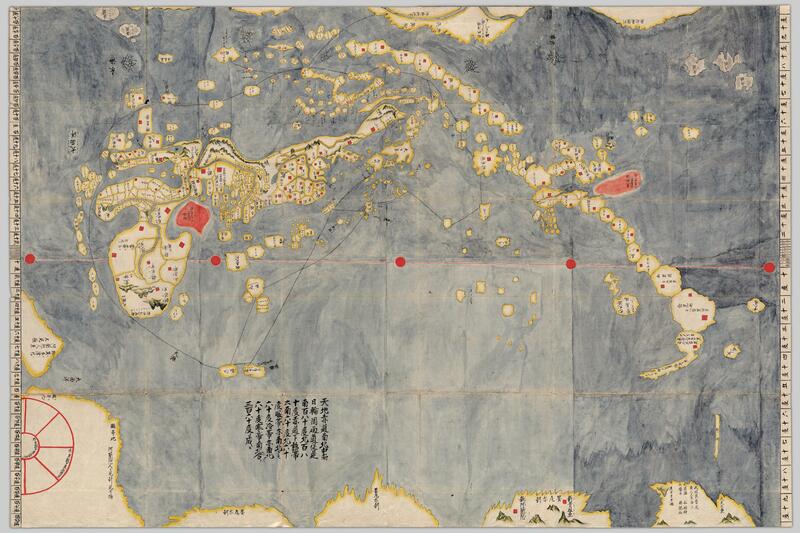 Explore the maps used in this essay, along with over 500 additional maps and atlases, in the UBC Library Open Collections Japanese Maps of the Tokugawa Era digital archive. See Yi-Fu Tuan, Topophilia: A Study of Environmental Perception, Attitudes, and Values (Englewood Cliffs, N.J.: Prentice-Hall, 1974). See Charles W.J. Withers, Zero Degrees – Geographies of the Prime Meridian (Cambridge, Mass. : Harvard University Press, 2017). Elisabeth Maria Jacobs, “The Red-Haired in Japan: Dutch Influence on Japanese Cartography (1640-1853)” (M.A. Thesis, The University of British Columbia, 1983). See J.B. Harley, The New Nature of Maps: Essays in the History of Cartography (Baltimore MD: Johns Hopkins University Press, 2001). For a recent application of new approaches to the history of maps in Japan see Kären Wigen, Sugimoto Fumiko and Cary Karacas, Cartographic Japan (Chicago: University of Chicago Press, 2016). Such as Hōtan, Nansen bushū bankoku shōka no zu 南瞻部洲萬國掌菓之圖 (‘Map of the countries in Jambudvipa’), 1710, woodblock print, 113.1 by 142.2 cm, University of British Columbia. Library. Rare Books and Special Collections. G3201 S2 1710 H6. 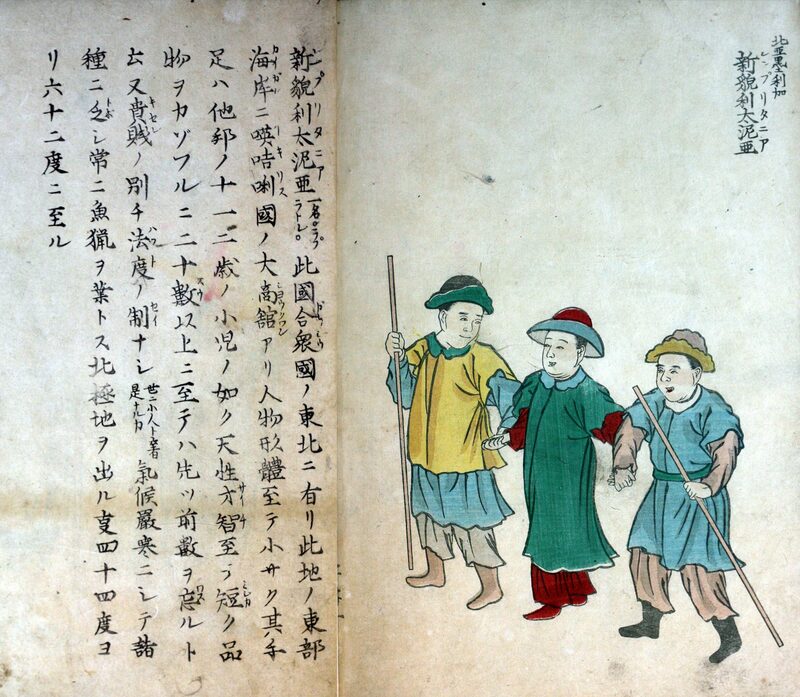 Manuscript copy of Bankoku ichiran zu by Ueki Naoki, Nanba Collection, Kobe City Museum. Copperplate was a novel technique in Japan. Some printers had done it in the preceding decades, but such prints were rather objects of curiosity. In the 1860s, copperplate prints started instead to be treated as serious objects, and the copperplate technique was seen as one of the technologies that needs to be taught by foreign experts such as Edoardo Chiossone. Peter Kornicki, The Book in Japan (Honolulu: University of Hawai’i Press, 1998), 168. J. Kuyper, Wereldkaart, naar en met de laatste ontdekkkings-reizen, opgedragen aan de to Nederlandsche Handel-Maatschappij (Amsterdam: C.F.Stemler, 1857). The Maritime Museum in Amsterdam holds a hand-coloured world map by Stemler, dedicated to the firm that succeeded the Dutch East India Company, the Nederlandse Handelmaatschappij, viewable at http://www.maritiemdigitaal.nl/index.cfm?event=search.getdetail&id=101003313. It is probably through that route that such a map made its way to Japan. Kokuritsu Rekishi Minzoku Hakubutsukan, ed., Yomigaere! Shīboruto no Nihon hakubutsukan (Kyoto: Seigensha, 2016), 144. Fred W. Drake, “Protestant Geography in China: EC Bridgman’s Portrayal of the West”, in Christianity in China: Early Protestant Missionary Writings, ed. Suzanne W. Barnett and John King Fairbank (Cambridge, MA: Harvard University Council on East Asian Studies, 1985), 89–106.